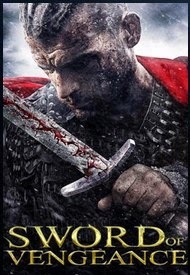 From the creator of ‘Hammer of the Gods’, starring Stanley Weber and Annabelle Wallis, the subjects of a ruthless tyrant’s oppression discover an unlikely freedom fighter whose code of honor demands bloody retribution. Don’t you like slow-motion scenes during bloody fights with a sword such as in “300“? You thoroughly enjoy a colorful film? And you expect a masterful story with clever twists? Then “Sword of Vengeance” won’t appeal to you. Firstly this medieval spectacle movie is painfully slow. And not because of the constant use of slow motion, but also because of the terribly slow dialogues. The first minutes you think it’s a gimmick made up by one of the crewmembers because he’s such a fervent fan of the movie “300“. Until you notice that almost the entire movie is in slow motion, ad nauseam. Had they limited themselves in using that film technique and inserted less breaks throughout the dialogues, then this film would be finished after 30 minutes. In addition, the whole film is grayish and dreary. The entire film is soaked in mud with a desolate landscape in the background. Red is the only striking color in this generally gray film, and this by the frequent spilled blood. The whole story is set in medieval England after the Battle of Hastings. Saxon England was defeated by William the Conqueror and is being suppressed by this merciless ruler in a rather barbaric way. In the north the English population is being exploited, murdered and humiliated by Earl Durant and his sons Lord Artus and Romain . As the introduction tells us there are mass killings, called The Harrowing, happening everyday and the locals are living in appalling conditions. Until one day a stranger appears and slaughters a few of Durant’s men. This warrior, called Shadow Walker, is a sort of “Conan” but less muscular and proud owner of a for that time fashionable hairstyle. Eventually he appears to be on a personal quest and he manages to gather some villagers around him to take revenge on Durant. The biggest flaw of this film is perhaps the simplistic and linear storyline. In terms of content there’s nothing much to see and don’t expect cunningly elaborated developments or characters. The emphasis is on the confrontation which means considerable swinging around with iron swords and other medieval weapons. It’s a concatenation of splashing mud, blood and spit (in slow motion of course). One can safely compared it to a game like “Ryse: Son of Rome”. Brutal, gray and bloody with saber-rattling as a central theme. A not so original film, probably appreciated by the fans of this sub-genre. It’s therefore unnecessary to discuss about acting performance as this was elaborated to the barest minimum. Tough body language is mixed with sometimes rather idiotic sounding dialogues. Stanley Weber looks like an unshakable battering ram who rushes straight to his goal and mercilessly makes sure that every opponent bites the dust. A kind of conqueror in his own personal territory. Annabelle Wallis as Anna (recently acting in the movie “Annabelle“) is part of the tribe that captures Shadow Walker. Afterwards they choose to stand next to him. She tries to play a temperamental and stubborn woman, but still looks a little too soft for that. The rest of the cast is just side issue. No memorable performances there.“Sword of Vengeance” is not a bad medieval action movie, but the end result is still a sort of go-for-it-without-thinking film.